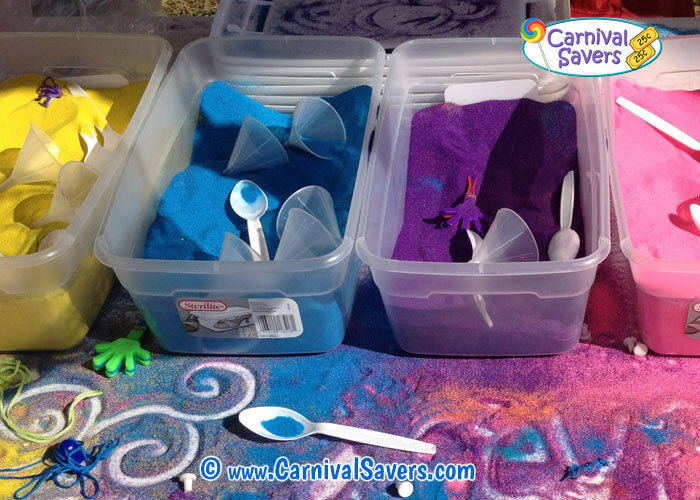 Sand Art Carnival Booth | Supplies - Colored Sand, Sand Bottles and More! Kids Tap the Sides of their art to "settle the sand"
TIP: Plastic Spoons and Funnels Are Easy Setup! Before the carnival, set out your tables and place your shallow containers on the table. Note: the images above show the containers right next to each other, but we have found that at least 6 inches or more space between the colors prevents children from reaching across one color sand to another, spilling mixing the sand colors. Open your assorted sand art bottles, and place in medium buckets. If you have different sized containers, charge more tickets for the larger container - not just for the cost of the container, but for the extra sand it takes to fill it up. Finally, most sand art bottles come with 1 funnel in each bag. 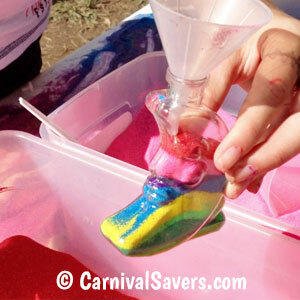 Remove the funnels and place a few in each color sand. Generally, the children will use one funnel for their entire craft, and give it back for the next child. Children choose a container and place one funnel in the top. Now, children will choose which color to add to design their sand art until the bottle is filled to the rim. Note: please remind children to tap their containers at the end to help the sand to settle and add more sand to the top to allow the sand to be packed in to keep its shape. 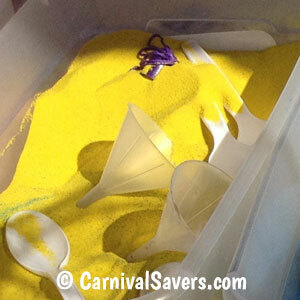 Adults or other carnival volunteers oversee this fun carnival booth and refill sand levels when needed. Be sure to help younger children with sand art lids, but for the most part – the kids run the booth by themselves! Carnival Savers Tip: When the kids think they are finished with their sand art, have them tap the side of their bottle to "settle the sand". They will be able to add more sand and the sand will "packed" in the container and prevnet the design from jumbling when then leave the booth! Savings Tip: we asked a local grocery store if they could donate 6 of their clear cookie containers. We cut the containers in half, and we had a fantastic inexpensive way to have sand ready for children to use on their sand art designs. Hint: Most schools charge at least $1.50 for kids to participate in this carnival booth. What a fantastically easy way to entertain kids while making a profit for your school or church fundraising event! CARNIVAL SUPPLIES for the SAND ART BOOTH!